On April 30, 2015, after more than ten years in space – four of those in orbit – MESSENGER‘s mission and operational life came to its conclusive (and expected) end when it impacted the surface of Mercury. While the spacecraft’s approximate impact location was predicted by mission engineers (it was out of sight of Earth at the time) it wasn’t until nearly a month later that the exact site was determined. 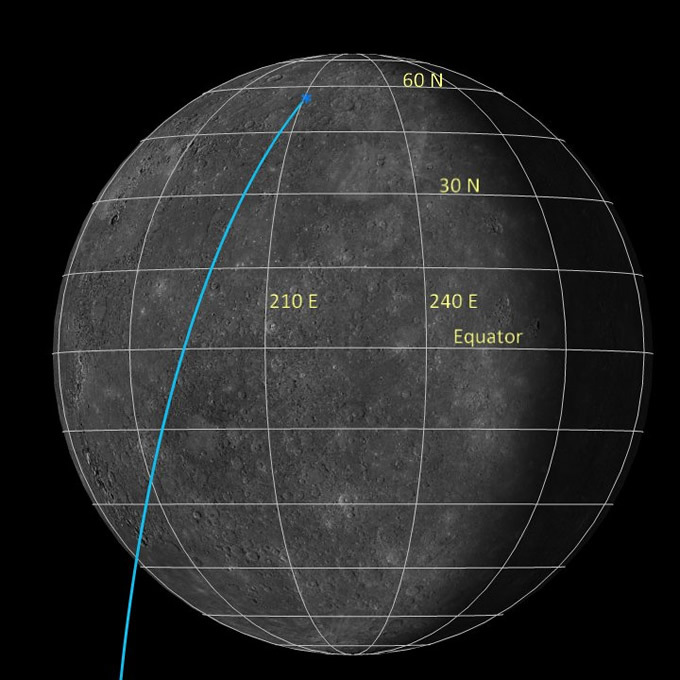 The team’s determination indicates that MESSENGER impacted into a part of Mercury’s surface that has a gradual incline with an approximate slope of 8.5°. The final estimate of the impact location is at 54.4398° N, 210.1205° E. This is extremely close to the original prediction of 54.4° N, 210.1° E.
The final determination of the impact time is 19:26:01.166 UTC (3:26 p.m. EDT) on April 30, 2015. 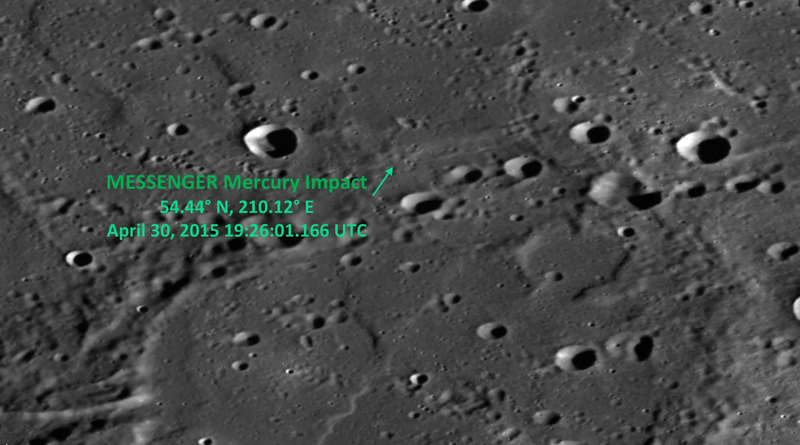 See MESSENGER’s last transmitted image of Mercury here. With a relative velocity of 8,750 mph (14,081 km/h) at the time of impact, MESSENGER likely created a new crater on Mercury 52 feet (16 m) across. When the next exploration mission, ESA/JAXA’s BepiColombo, arrives at Mercury in 2024 it can search this location for MESSENGER’s mark. Previous Post Here’s Pluto Like You’ve Never Seen It Before! It’s amazing how much we’ve learned about the solar system from probes like Messenger – none of these ventures are much in the public mind, but all of them have revolutionised planetary science. We live in a very cool age. Yes indeed !! We live in a very cool age and… it’s not ended yet !! Reblogged this on The Astrophysicist.